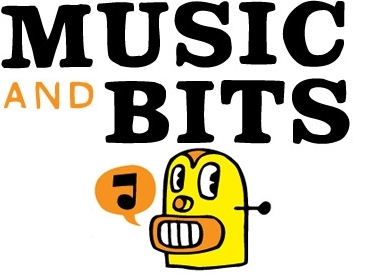 As a follow up to my previous post about the Music and Bits conference, I wanted to cover off on the other topic of the day, marketing. Out of the five companies who presented two of those, Top Notch records and TopSpin media, discussed the current landscape of music marketing for artists and bands. Farid Benmbarek from Dutch record label, Top Notch discussed his labels point of view on social media as a means for marketing. In general it was all of the usual stuff that us new media types would expect – make sure you’re on Twitter, Facebook, YouTube, etc. Initially I was a bit skeptical about Benmbarek’s council on navigating artists through social media being that he said the first thing an artist must have is a website and a newsletter. I think this is a bit outdated. Those things are both expensive to get off the ground so why not start with the free services, build your brand and increase your following then use a website as your hub? But Benmbarek did have some interesting perspective to share regarding YouTube. As YouTube has shaken up television’s monopoly it has become a benchmark for success in terms of measuring ratings, how many views a video has, etc. According to Benmbarek YouTube definitely influences the charts. 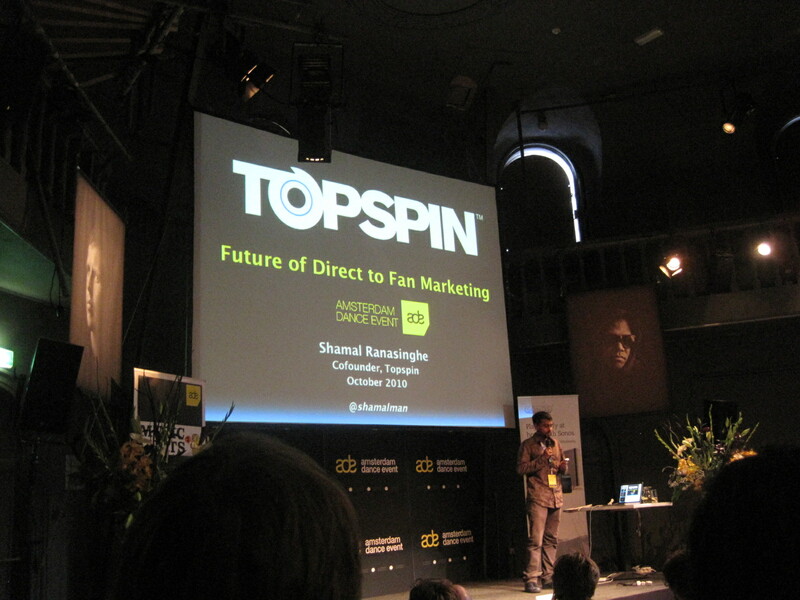 Switching gears, Shamal Ranasinghe, co-founder of TopSpin, concluded the day with his presentation on the “Future of Direct to Fan Marketing.” Two years ago I sat in on a demo from TopSpin at SXSW and I wasn’t exactly sure what I had just witnessed, was it professional social media-ing? This presentation assured me that it’s much more than that. TopSpin’s approach involves mining data to analyze fans and their behaviors. Ranasinghe who recently moved to London to open up their first international office says the TopSpin methodology is to “react, engage and convert.” Rather than butcher what it is exactly that TopSpin does I’ll point you to this article which attempts to dissect their platform. In short they grow fanbases and increase artist revenues by bundling products together (usually on top of digital albums). Their average transaction per fan is around $22 compared to the average cost of buying an album at say, $9.99 on iTunes it’s not a bad margin. Had there been more time for questions I think this would have easily been a longer discussion as people were eager to dig deeper and in a way critique what TopSpin has managed to do for their artists. Some of the criticism is that TopSpin won’t work for a small indie band, only large established artists such as current clients like Eminem, Paul McCartney and Beastie Boys. Ranasinghe acknowledged that they’ve seen great success with those artists simply because they have more fans and money to work with but that shouldn’t discourage small bands from using their platform. It’s all relative. I really enjoyed this conference. It was managed well, the set up was nice, the venue was great and the speakers were interesting and engaging. I also felt like I learned something which is what every conference aims to do but very few actually achieve. 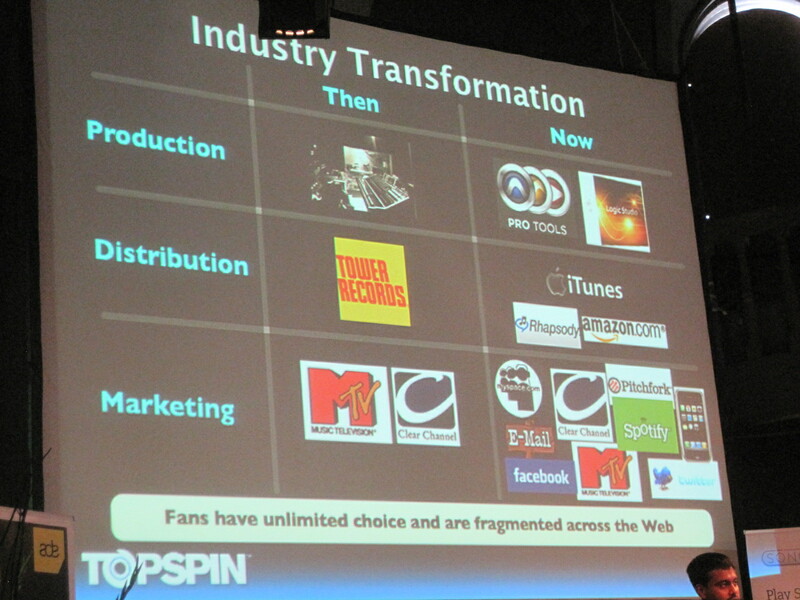 I was wandering what will be the future position of the radio and internet radio as a marketing tool for music. For me still is radio a great way to get to know new music. You can find new music with Spotify for example, but with some songs you first have to hear these songs many times before you fall in love with the song. This happens when you are listening to the radio with a limited playlist. That is a very valid point! The primary way I discovered new music was when I was listening to the radio on my commute. I had satellite radio in my car and I rarely listened to anything else (ie, iPod, cd’s). You can of course buy the satellite radio services to be able to stream online or purchase a hard product. To me that seems like too much effort though. But I often turn to internet radio as a “last resort” to cure boredom with my current music. When I had convenient access to a radio this was completely the opposite.